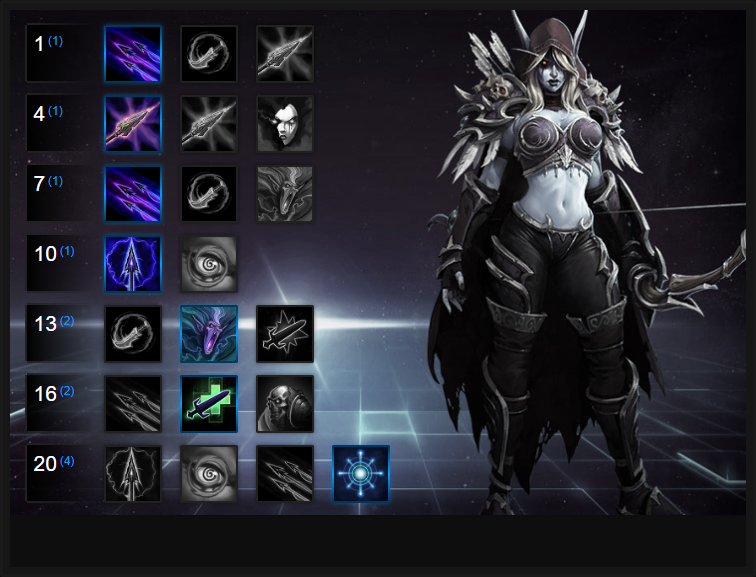 In this Sylvanas Build Guide, we provide an overview of her strengths, abilities, talents, and matchups. Sylvanas is arguably one of, if not the best Specialist in Heroes of the Storm. Her lane clearing is strong and her Heroic ability can turn the tide of any team fight. She has good mobility, can select Talents to make her potent against enemy Heroes and most of all, she's a lot of fun. Unlike Murky or Gazlowe, she's undeniably valuable in a team fight and her Wailing Arrow can easily turn any encounter in your teams' favor. Despite her strengths, players have grown wise to Sylvanas' "outs" when using Haunting Wave, so she has - over time - gotten more difficult to play well. In the right hands however, and if your team are already winning, she's incredibly strong thanks to her push potential. Black Arrows (Trait) – For its full description, Black Arrows has changed a fair bit. Activate to cause all Basic Attacks and Abilities to Stun Minions, non-Elite Mercenaries, and Structures for 3seconds. Lasts for 10 seconds. Basic Attacks infect enemies with Banshee's Curse for 3 seconds, stacking up to 3 times. Deal 25% more damage to enemies with 3 stacks. In simple terms, it's value in shutting down minions is now limited with a 40 second cooldown. Not only that, but it has a great passive that allows Sylvanas to stack Banshee Curse against Heroes. It's incredibly important to reach 3 stacks to make use of its damage modifier. Withering Fire (Q) – This is Sylvanas’ main ability, and it’s an excellent one. Unlike in previous iterations, Withering Fire will unload all five shots at the nearest target. If that's a minion, it'll only hit one. However, if it's a Hero, it'll prioritize them. Ideally you want to be unloading Withering Fire against a Hero who has 3 stacks of Banshee Curse to utilise the damage modifier, or if in lane, use it just to poke when you've a clear line of sight. Just be conscious of the cooldown, and the fact wasting 5 shots on minions isn't ideal. Shadow Dagger (W) – To trigger the spread of Shadow Dagger, you'll need to hit the target affected by it with a basic attack. Once you do, it'll erupt and spread to allow those around its source. Ideally you want to land Shadow Dagger on a Hero, and explode it amongst other Heroes, or minions. Using Shadow Dagger purely on minions - without inflicting it upon a Hero - isn't optimal in her new kit. Haunting Wave (E) – As an ability with some range, Haunting Wave can be used to finish off a fleeing opponent or halt a minion wave. The damage isn’t very high, and it should rarely be used for that purpose. This ability is invaluable however as an escape tool and should usually be saved to get out alive. Just be aware that any crowd control or silence can prevent you from re-activating to gain the teleport. Mind Control (R) – Allowing Sylvanas to control any player she wishes, from a generous range, Mind Control lets Sylvanas possess an enemy and move them at her will. It's great for picking out a squishy target and moving them towards your enemy team. Not only can it be used offensively in this way, but it can also be used to prevent players escaping. Just be aware that Mind Control is a skill-shot, and Sylvanas can still move after she casts it, and while a player is under her Control. It's important to note however that those under its spell don't move quickly to Sylvanas, so you and your team need to maximize the lock-down quickly. Wailing Arrow (R) – The damage of Wailing Arrow is actually rather good, and can be a good burst of up-front damage in a team fight, especially considering it doesn’t have collision. With that said, the silencing aspect of this ability is where it truly shines. It can interrupt important channels, prevent big Heroics from being used at the optimal time, or even set up your teammates to more easily hit their own abilities. Every hit with Withering Fire against a Hero increases your Spell Power by 5% for 6 seconds. For bonus damage, Might of the Banshee Queen is great and works well late game when you can reset Withering Fire with Haunting Wave. Unstable Poison causes minions to explode when they die, and are affected by Withering Fire or Shadow Dagger. For quick lane clear, especially mid to late game, it's great. Barbed Shot allows the 5th arrow from Withering Fire to deal 350% bonus damage. If you're at 3 stacks of Banshee's Curse, it seriously packs a punch. Sylvanas' ranged silence (Wailing Arrow) remains invaluable and considering it can be launched from range, allows you to not only silence a specific Hero from afar but also ensures you can grab a group of enemies clumped together. It's damage is also reasonable and great for finishing off low health players. Wind Runner simply grants a second charge of Haunting Wave, with the second teleport allowing Sylvanas to recharge Withering Fire. Great for hunting down opponents. Variable: Shadow Dagger already has a long reach, so being able to cause Vulnerability with it really helps your team spike opponents down. Using Shaddow Dagger followed by Mind Control, to walk a vulnerable enemy player into your team, can gaurentee kills. Cold Embrace is amazing. Life Drain grants 15% healing based on damage dealt, against targets with 3 stacks of Banshee's Curse. When quickly rattling off Withering Fire, it's brilliant. Against a CC heavy team, take Bolt of the Storm. It'll allow you to escape easily and re-enter combat to continue fighting. This list of tips and tricks are just a handful of things we think will help your Sylvanas play. We'll continue to add to the list as required and if you have any tips you'd like to share, let us know in the comments below and we'll place them here. 1. When using Haunting Wave it's a good idea to fire it off, run in a different direction then teleport to the wave. This confuses your enemies, rather than just running forward. 2. Late game and with the above build you can kill a wave of minions in literally seconds. Use this to push lanes and camps constantly. 3. Remember Shadow Dagger applies a short damage over time effect after you explode it. 4. Wailing Arrow can be triggered to stop and detonate - do this for optimal casting against groups of Heroes. 5. You can use Haunting Wave to pass through scenery to appear on the other side. This is your most reliable means of escape, rather than running in a straight line. 6. Even though you should concentrate on lanes and minion clear, you need to support your team. Shadow Dagger causing vulnerability will help your team hugely, so will your Withering Fire burst. 7. Remember you've very squishy - only use Haunting Wave offensively if you know you have support or can guarantee a kill. 8. Shaddow Dagger has a deceptively long range. Use it to poke as much as possible. 9. Mind Control can be an effective variable but you're vulnerable when using it. That said, it can work against some compositions - especially the likes of Lt. Morales. 10. Try to encourage your team to help you take structures when you've disabled them. It'll force the enemy team to react. 11. Don't be afraid to split push as Sylvanas, even if it means your team is 4 versus 5. If the enemy team don't deal with you, they'll quickly lose a fort.